When I sit down to knit or crochet, I usually have an idea of what my goals are, but not in a weird nerdy way where I think to myself “Today’s knitting goal is…” When approaching a project we’re usually in a particular mindset though. Sometimes I choose a project for the beautiful detailing integrated in the project, sometimes I’d like to forget about my day and choose a project that requires extreme focus. Other times the project I choose is for passive knitting and something to keep my hands busy when chatting with friends or watching television. We can set ourselves up for success if the intension is to knit to relax. When I’m seeking a time to just chill out and knit my heart out, then I look for a pattern that’s not going to be overly complicated or above my skill set. Patterns where most of the stitches are understood and repeats are simple are best suited for relaxing knitting. Some of the patterns I choose can also double as good TV knitting, patterns, but generally these are more detailed and have a medium difficulty rating. Of course choosing a project that incorporates mostly known stitches and medium difficulty rating is dependent on your particular skill set and how you usually approach knitting. We know there are health benefits to knitting and crafting in general. Doing something pleasurable also helps to relax the body and knitting can be soothing. 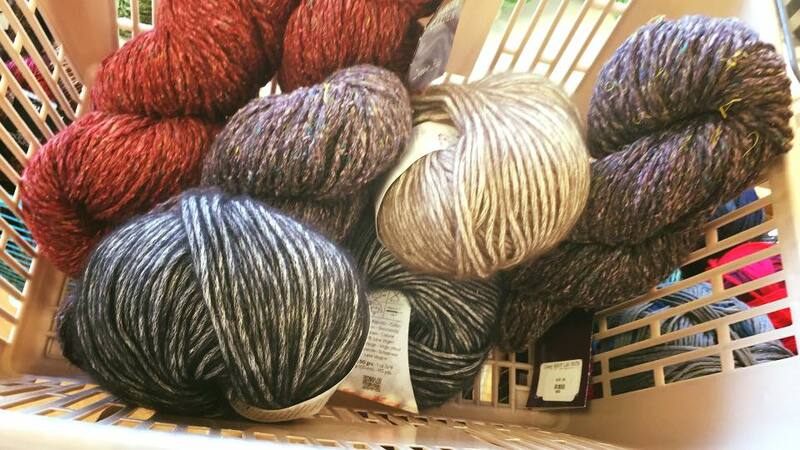 So we love to knit and feel the calmness that comes with creating something beautiful (usually) with a couple of sticks and string, but how do we ensure we choose the right project when knitting to relax? What I’ve found over the years is to focus on elements within a pattern as opposed to the pattern in it’s entirety when there’s a specific knitting goal in mind. When looking to knit to relax, understand that many patterns vary in complexity within the project itself. The first sweater I ever knitted included yarn overs integrated into the raglan shaping. I was brand new to knitting, only having knit a dish cloth before starting on that sweater. Was that ambitious? 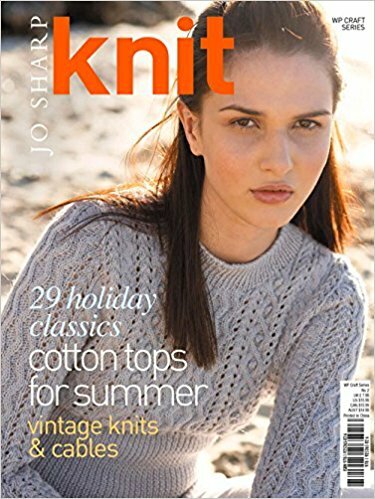 Yes, did it quench my knitting thirst? Yes. I taught myself how to knit with the use of a helpful app and the My First Sweater class on Craftsy. I chose to knit a sweater for myself as my second project because I knew the project would incorporate many skills that would be needed for other knitting projects. I also knew that once I got into the rhythm, it would be relaxing. My first several rows of yarn overs were frustrating, but the ribbing and body of the sweater was a breeze. Later, once I had a better handle on knitting and how to read and interpret a pattern, I was able to seek patterns based on what I was trying to accomplish. This sweater tank was a simple pattern knit in the round. It was easy and also made for great TV knitting, but it also included a couple little fun details. The front accent was simply made by ribbing. When knitting in the round, I simply had to pause at the stitch markers, knit in the rib pattern and then carry on in stockinette stitch until I reached to sides where the increases and decreases were incorporated. The simple lovey pattern (pattern review here) was a fun knit and it was perfect to knit for relaxation purposes. The diamond motif pattern that I used for the blanket portion of the lovey was just enough to keep me on my knitting toes and easy enough to provide a mental break from the day. Jo Sharp has some beautiful patterns that are simple to knit and provide beautiful results. I have several of her pattern books and am amazed at the simplicity of her patterns, but have learned the hard way not to over estimate the simplicity. I was knitting a sweater that incorporated an 8 stitch rib-type pattern repeat and realized that somewhere along the line I started working up 10 stitch repeats instead. Whoops! 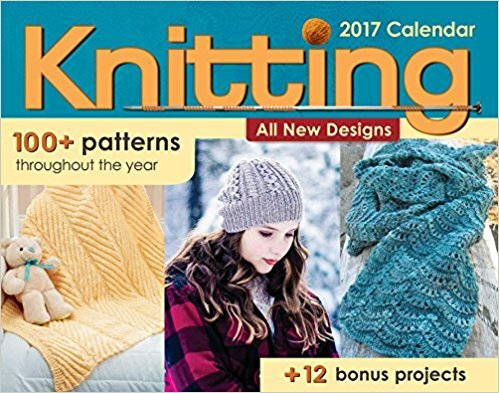 If you like to make progress quickly on your projects, then one of my favorite pattern sources lately has been a knitting calendar that was given to me as a gift. This calendar includes over 100 different patterns and many of them vary in both complexity and type. Many of the projects are on the smaller side and easy to whip up in a fairly short period of time, so not only are you getting some relaxing knitting time in, but also high satisfaction from completing a project! The last resource is near and dear to my heart, it’s the first sweater I ever knitted and one of the first knitting projects I ever created. 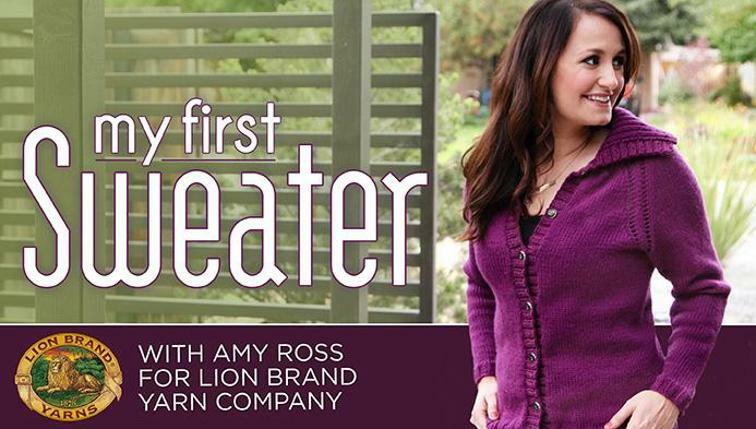 It’s Lion Brand’s My First Sweater pattern. There are several variations on this sweater, you can create a cardigan like I did, or a pullover. You can also choose which sleeve length to knit and choose your favorite collar style. If knitting a sweater would stretch your skill set, then sign up for the Craftsy class that guides you through each step of the way. If you’re a pro at knitting up sweaters in no time at all, then this pattern still deserves a place in your knitting library. I’d love to hear if you have any favorite patterns or knitting resources. Leave them in the comments below!